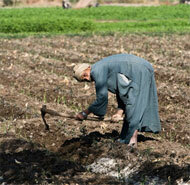 Asswan (Assuan), the ancient Syene, lies on the right bank of the Nile, 886 kilometers from Cairo. This is where the Valley of the Nile with its typically gentle landscape ends. This is where Egypt ends and Nubia begins. Here there are endlless kilometers of desert sands and the majestic still waters of Nasser Lake. The Nile is transformed and the smooth tranquil waters givw way to the sudden troubled waters leaping and eddying around the rocks of the First Cataract. Trade and barter went on here as early as the third millenium. Nubia, whose ancient name nub means "gold", has always been a land of conquest and exploitation. 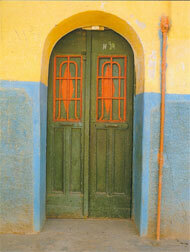 The doorway to black Africa, the only communications route between the sea and the heart of the black continent. Nubia provided the pharaohs with their best soldiers, highly prized woods, precious ivory, perfumed spices, the finest ostrich feathers - as well as gold. Syeniete - that pink granite so widely used in Egyptian religious architecture in the building of temples, the sculpting of colossi and obelisks - came from its many rich quarries. It was so abundant, that the quarries were still in use in Roman times. 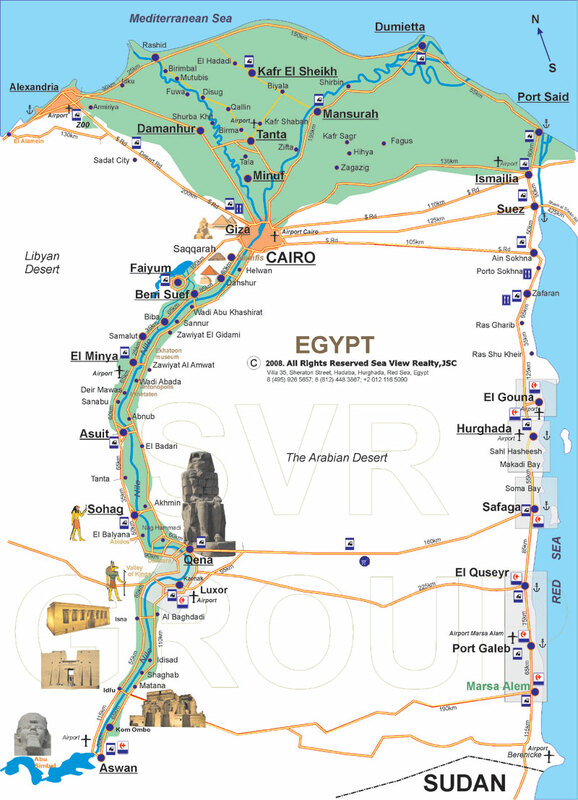 Syene was also of basic importance in controlling both the river traffic and that of the desert caravans. The pharaohs maintained an armed garrison there and made Syene, the capital of the first nome (district) of Upper Egypt. The Tropic of Cancer, which now lies somewhat further south, originally passed here. Proof of this, is the presence of a well whose straight sides are illuminated by the rays of the sun without shadows only at the summer solstice. This was how the Greek scientist, Eratosthenes calculated (with a minimum of error) the length of the terrestrial meridian and concluded that the earth was round. In early medieval times, the city was subject first to the incursions of the Blemi, from Ethiopia. It then fell victim to a violent outbreak of the plague. It was gradually abandoned and revived only after the Turkish conquest of Egypt. Its modern name derives from the old Egyptian « swenet » meaning « trade », transformed into the Coptic « suan » and then into Aswan. Nowadays, in addition to its purely historical and archaeological interest, the mildness of its climate has made Aswan an ideal winter resort. Elegant hotels equipped with every imaginable comfort have risen along its banks; cruising yachts by the dozens sail up the Nile and anchor here for days at a time so that the ever growing number of tourists can visit the exceptional surroundings of the city. It is, lastly, the most important departure point for the excursion to Abu Simbel, jewel of the desert. When evening falls, Aswan is suddenly bathed completely in violet, while the feluccas glide silently over the water, dotting the river with their enormous white sails. No other place in Egypt has the luminosity and silence that reign in Aswan. While the rich granite quarries were in ancient Syene, most of the trade took place on the Elephantine Island. It was here that the governor of the province had his residence, and it was also the center of the cult of the ram-headed god Khnum. Originally the island was named Yebu, which means « elephant » in Egyptian. The Greeks translated it into Elephantine, probably because this was where ivory from Africa was traded. The island is 1500 meters long and 500 meters wide. It now incorporates two typical Nubian villages and the large Hotel Assuan Oberoi as well as the Museum of Aswan and the archaeological zone of Yebu. To land on the island, one passes below enormous rocks covered with graffiti and inscriptions dating to the 18th (Thutmosis III and Amenhotep III) and the 26th dynasties (Psamtik II). You dock at a tiny pier constructed of material that came from buildings dating to the New Kingdom. Since 1912, this small museum has been installed in the villa that belonged to William Wellicocks, the English engineer who designed the Old Dam of Aswan. In fact it has all the appearance of a charming inviting colonial house, with a veranda opening out onto the garden, with flowers and plants growing all around. The archaeological finds in the museum all come from excavations undertaken in Aswan and other sites in Lower Nubia. 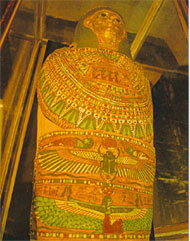 Of particular interest is the mummy of the sacred ram in a gilded sarcophagus. It dates to 330-305 B.C. and was found in a tomb right behind the museum building. Khnum was considered the creator of mankind and since he was said to have modelled the first man from the clay of a vase. He was worshipped as the patron of the potters. At Aswan he was associated in a triad with Anukis, goddess of the island of Siheyl and with Satis, goddess of the Elephantine Island. The ancients also believed that Khnum lived in a cave nearby and that this was where he hid the flood which periodically overran the island. Also to be noted is the cosmetic palette in slate kept in a showcase in the first room. It is odd in that it is in the shape of a rhinocerous which was an unknown animal in Egypt at the time. Immersed in the green of the palm groves on the Elephantine Island, three Nubian villages transport us — without warning — into a different world. Here the inhabitants, extremely courteous, are always ready to offer the visitor a cup of perfumed mint tea. The houses are brightly colored in green, blue and yellow. Often the black cube of Mecca, the sacred Kaaba, is painted on the exterior, a sign that the owner of the house has been on pilgrimage to the holy city of Mecca. Sometimes the means of transportation are also painted — a plane, a ship, a car. . .
North of Elephantine is the Island of Trees, better known as Kitchener Island. Lord Horatio Kitchener was an English general who had fought valiantly in Sudan in 1898, defeating the army of the Mahadi. As Consul General in Egypt, he fell in love with this island in the middle of the Nile, where he could give free play to his passion for exotic flowers and plants. This spendid botanical garden contains the rarest examples from Africa and Asia: a symphony of colors and fragrances accompany us in our leisurely wanderings along shady avenues. Bougain-villeas and poinsettias, hibuscus. clematis, mangoes, sycamores, fragrances that are pungent or subtle, shades of color ranging from brilliant reds to delicate pinks. Birds also love this enchanted garden and live here undisturbed among the bushes and the underbrush. In the southern part of the island, a tiny bay populated by white ducks has been created under a lovely terrace, where one can sip karkade in blessed peace. EGYPT is located on a major bird migration corridor between Africa and Europe.